Note to Self: Never threaten to stab Dustin Poirier (pictured) in the neck. That’s generally my rule of thumb with everyone, but I’ll definitely follow that policy if I ever cross paths with Poirier. According to Poirier, the reason he got in Diego Brandao’s face at Friday’s UFC 168 weigh-ins was because Brandao threatened to stab him in the neck just seconds before they tipped the scale. Many thought Poirier was pissed at Brandao because he disrespected him by coming in a whopping seven pounds over the limit for their featherweight affair. However, it was the whole neck stabbing thing that triggered Poirier’s rage. “Actually, on stage I was so mad because before we walked on stage to weigh in he told me he was going to stab me in the neck,” Poirier revealed during UFC 168’s post-fight press conference. “They had to separate us. The guy’s nuts. That’s why I was so upset. If Brandao was trying to intimidate “The Diamond” with his threat, it didn’t work. 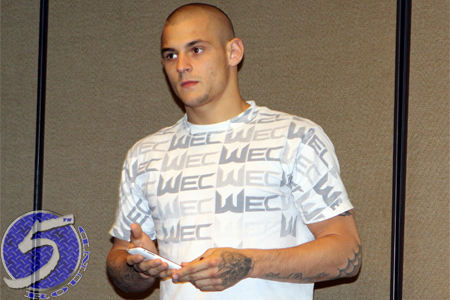 Poirier knocked him out in the opening round on Saturday night. No only did Poirier leave Las Vegas with a win, he also scored 12.5 percent of Brandao’s purse for missing weight. There are rumors swirling that Brandao came in heavy because he was involved in a car accident prior the fight and couldn’t train for a couple of weeks. UFC president Dana White had a conversation with Brandao after the bout, but he refused to go into specifics about their chat.